In lieu of flowers memorial donations may be made to “Shop With The Lions” and left at the funeral home. 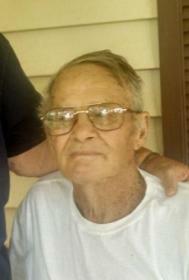 Harvey Ernest Faith, age 87, of rural El Dorado Springs, MO, passed away on Monday, November 24, 2014. Harvey was born March 6, 1927, at Orchard, NE, the son of Ernest and Dorothy Faith. Harvey married Edna Clark on October 20, 1949. They were married 65 years. To their union five children were born. Harvey and Edna spent many years of their married lives on a farm at Waterbury, NE, where they raised their children. Harvey was a hard worker and enjoyed farming and gardening. Harvey also worked 26 years at the IBP Packing Plant in Dakota City, NE. Preceding Harvey in death were his parents; one son, Harvey Jr.; one brother, Alton Jay Warner; one sister; one granddaughter, Cynthia Sue Faith; and one infant grandson, Kenneth James Faith, Jr. Survivors include: his wife Edna of the home; four children: Sandra Custer of LaMars, IA; Evelyn Burcham and husband Francis of Pender, NE; David Faith and wife Cathy of South Sioux City, NE; and Kenneth Faith and wife Jody of Weaubleau, MO; three brothers: Roland Faith and wife Rose of Scranton, AR; Tom Warner of Carter Lake, IA; and Jack Warner and wife Janice of Greenville, SC; twelve grandchildren; eleven great-grandchildren; and two great-great-grandchildren. Funeral services for Harvey Faith will be held on Friday, November 28, 2014, at 10:00 a.m. at the El Dorado Springs First Baptist Church. The family will receive friends at the church from 9:00 a.m. until service time. Rev. Ron Marsh will officiate. Burial will follow in Robison Cemetery under the direction of Bland-Hackleman Funeral Home. Pallbearers are: Todd Jasa, Terry Jasa, Robin Burcham, Frank Burcham, Mark Faith, and Larry Faith. Honorary pallbearers are: Troy Custer, Matthew Burcham, Rebecca Burcham, and Tim Faith.